MMR is probably the most controversial vaccine. A two shot series of this live inactivated vaccine protects against Measles, Mumps and Rubella. Side effects include rash and fever typically 7-8 days after the first vaccine. Unlike, most other vaccinations the medication itself burns when injected. The MMR controversy began when Dr. Andrew Wakefield reported a link between the MMR and Autism in the British Medical Journal "Lancet" in 1998. Dr. Wakefield’s study is seriously flawed. His study involved only 12 patients and the controls were children at his daughter's birthday party. The British General Medical Counsel reported Dr Wakefield received unethical payments from personal injury attorneys representing people in the study group. The majority of the studies co-authors have disavowed the study. There have been numerous larger studies done since Wakefield's original study, but none have confirmed Wakefield's findings. My children have all had their vaccines as I do not think the MMR causes autism. 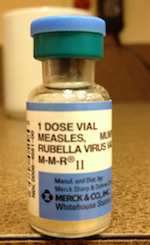 What are your thoughts in vaccinating earlier than 1 year old for measles given the current outbreak originating in California?